Thanks for your informative Isai payanam programs. The melody is quite haunting. The versatility of Ilaiyaraja had already been reflected in “Aayiram thaamarai mottukkaley” from Alaigal Oyivadhillai(1981) and some dozen songs that followed suit from the same composer in the same tune during the same decade. This is a glaring omission in this article. Depending on the handling of the Madhyama, and Nishada, shades of Subhapantuvarali, Bhavapriya, or Lalit will be evoked. Film music directors have no compulsion to stick to any one raga, hence these overlaps and ambiguities. 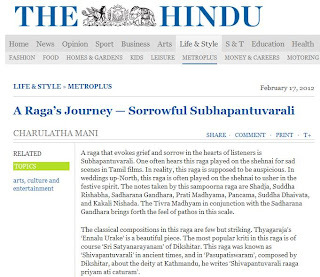 If Mr. Kumarasawamy spends more of his time on actually listening to the songs or cultivating a sense of pitch or ear for music, he would not be over-emphatically (and pedantically) classifying some of these tunes, in many cases second-guessing the composer himself! In the mail sent to you yesterday on the subject matter kindly correct the music composer of the soulful Subhapantuvarali devotional song “Kaalai ilam kadhiril undhan kaatchi theriyudhu” sung excellently by Sirgazhi Govindharajan as M Ranga Rao. I have mistakenly mentioned it is composed by D B Ramachandran. Not to worry, we are not publishing or including your lists anywhere as they are unverified and invariably contain at least a few errors. Please note that except for shadjam and panchamam, notes take different swara sthanas (tivra/komal, kakali/kaisiki, shuddha/antara, shuddha/chatusrati/shatsruti etc.) As you do not seem to have a trained sense of pitch you should try to cultivate one before making authoritative pronouncements on ragas. For instance, in your "comments" you seem to regularly confuse shuddha and prati madhyama notes, or are unaware of the distinction.